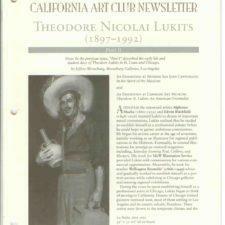 Among the many hundreds of painters that comprise the relatively recent, but illustrious history of California art, the career of Theodore Nikolai Lukits stands out as unique in its variety, complexity, breadth and quality. Lukits was a well‑trained and astute draftsman as well as a brilliant colorist and fastidious craftsman. He ground his own paints, made his own pastels, created customized palettes, crafted his own brushes, and carved and gilded his own frames. By teaching for more than 60 years, he made a lasting contribution to the dissemination of the ideals and techniques of 19th century French ateliers and academies. Theodore N. Lukits was born on November 26, 1897 in Temesvar, Transylvania, which was then a part of the Austro‑Hungarian Empire. When he was two years old, his parents took him and his eleven year old sister, Mary, to the United States where he was raised in St. Louis, Missouri. As a child Lukits was already showing signs of a precocious artistic talent. Before he was twelve, his parents enrolled him in classes at the School of Fine Arts at Washington University where he studied with the renowned tonalist Henry Wuerpel (1866‑1958) and the celebrated American impressionist Richard E. Miller (1875‑1943). By the time he completed the eighth grade, Lukits was determined that his future would be in art. He left school and moved with his family to Chicago, then the major art center of the Midwest. There, he studied with the Munich and Paris trained painter Victor Higgins (1884‑1949) at the Academy of Fine Arts, followed by attending summer, evening, and weekend classes at the prestigious Art Institute of Chicago. To support his art education, Lukits worked as a jewelry designer and, as his artistic skills improved, as an illustrator for both local magazines and national publications, such as the Saturday Evening Post. At the Art Institute, Lukits had the good fortune to study with a faculty of exceptional painters who had all studied in the ateliers and academies of Europe. The competitive environment challenged Lukits to excel. He progressed rapidly from drawing from the antique, to life study, and then to composition and portraiture, winning major prizes throughout his tenure. 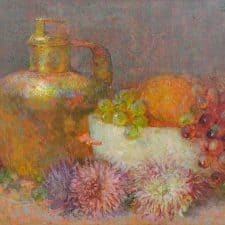 The young artist studied primarily with the Paris and Munich trained portrait painter Wellington J. Reynolds (1866‑1949) and the American Giverny Impressionist Karl Buehr (1866‑1952). Lukits also worked closely with Harry M. Walcott (1877‑1930) and with the American realists Charles W. Hawthorne (1872‑1930) and George Bellows (1882‑1925) who were both guest instructors at the Institute. By the time Lukits graduated from the Art Institute in 1918, he was already developing a reputation as a portrait painter and was exhibiting in Chicago galleries. 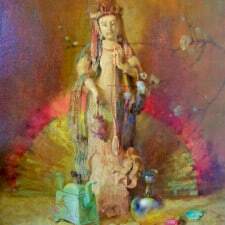 In 1918 he won the Faculty of Fine Arts Award and the Bryan Lathrop Traveling Scholarship. He returned to the Art Institute in 1919 for post‑graduate work and studied one year later with the leader of the Art Nouveau Movement, Alphonse Mucha (1860‑1939), who was touring with works from his great Slav Epic series. Lukits completed his studies in anatomical drawing by dissecting cadavers in medical college. 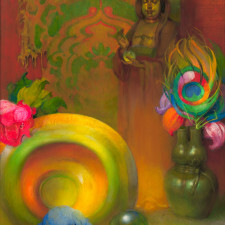 While painting a portrait of the silent film star, Theda Bara, Lukits was encouraged by the actress to move to Los Angeles and paint portraits of Hollywood celebrities. 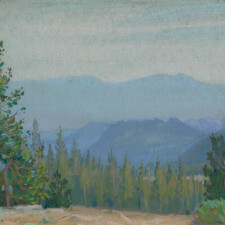 Lukits decided to accept Miss Bara’s advice and moved from Chicago to southern California, following a similar path that had been trod by other noted painters, including William Wendt (1865‑1946), Joseph Kleitsch (1885‑1931), and George Demont Otis (1879‑1962). In Los Angeles, Lukits continued creating illustrations and commercial work as he built a following for his portrait and still‑life paintings. 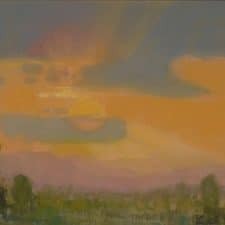 Like many other painters who had moved to California, Lukits was fascinated by what he described as “that California light” and embarked on a series of sketching trips that took him throughout California and Arizona. 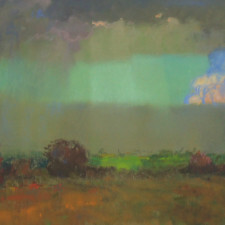 When he worked en plein‑air, Lukits preferred the portability of the pastel medium compared to that of oils favored by most plein air painters used. While many of the American Impressionist painters used pastels out‑of‑doors, none used the medium as proficiently as Lukits. 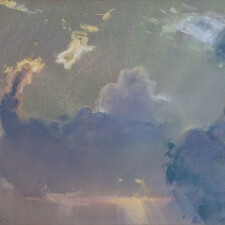 Because pastels were lightweight and required no set‑up time, they were ideal for the high‑altitude locations and ephemeral conditions of light that Lukits favored. 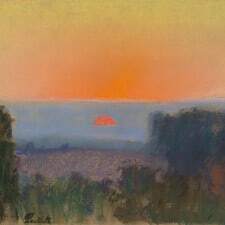 He also believed that the unique vibrant quality of the pastel medium was ideally suited in expressing the early morning, late afternoon, and evening moods that captivated him. 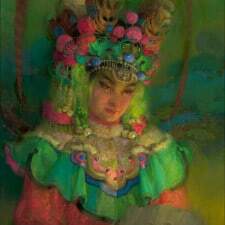 After less than five years in southern California, Lukits developed a reputation as an exceptional portrait painter. His strength in the decorative portraits he brought with him from Chicago as wells as a number of successful commissions he completed for Hollywood film stars and moguls was evident. In 1926 Lukits garnered great acclaim for his full‑length portrait of the Mexican-born screen beauty Dolores del Rio, which was exhibited extensively and reproduced widely in Los Angeles and Mexico City newspapers. 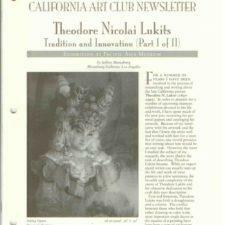 From the early 1920s, Lukits exhibited with the California Art Club, the Painters and Sculptors Club, and many other Southland art organizations. 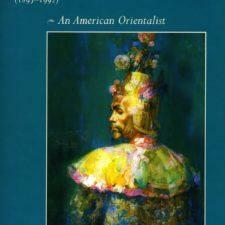 In addition, he sent his works to East Coast museums, including the Corcoran and Carnegie. 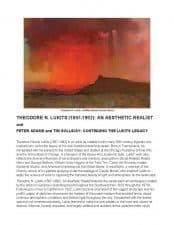 From 1926 through the late 1930s, Lukits held a number of solo exhibitions at prominent galleries, including the Sotheby Salon, Montmartre Cafe, Stendhal Gallery, and Ainsle Galleries. Lukits began teaching in 1924 and devoted most of his time to his students, leaving less opportunity to travel and paint large‑scale works. During the Great Depression, his teaching income was most welcome. After the end of World War II, Lukits expanded his school to accommodate returning servicemen studying on the G. I. Bill. 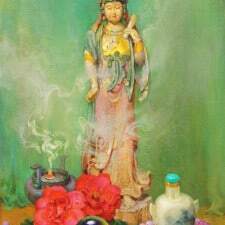 Lukits believed in beauty, and through his students he fought to transmute the artistic ideals of his youth to future generations. 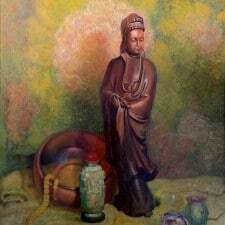 A spark of happiness for Lukits came toward the end of his life when he witnessed a resurgence of traditional fine art appreciation, as his last generation of students began experiencing widespread success as fine artists. Through the 1980s, although his memory was fading, Lukits continued teaching. At the age of 90, he began experiencing dizzy spells and decided to retire. 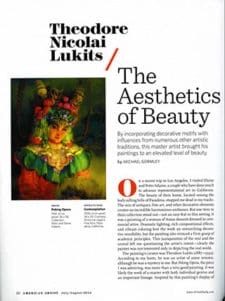 In 1992, at the age of 95, Lukits passed away, leaving a legacy of magnificent paintings and a career that belongs to the annals of American art history.